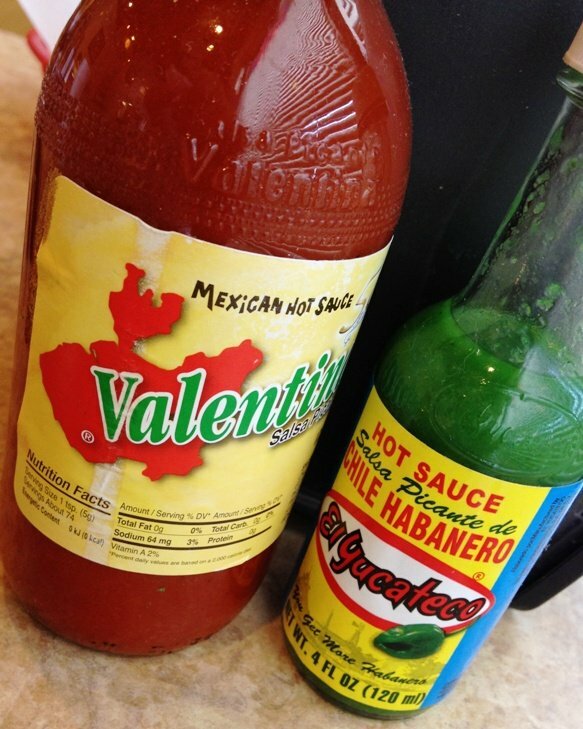 Double your Mexican Deliciousness at Los Cuates in Raleigh! 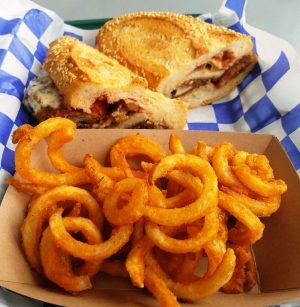 While a lot of people in the Triangle adore Chubby’s for their Mexican food fix, there are other down-home choices. Places where the locals eat and the food is about authentic as you can get. Out in Raleigh one of my personal favorites is Los Cuates! Located ITB (Inside the Beltline), they’ve got one drive-thru location on Capital Boulevard and another sit-down location on Old Wake Forest Road. 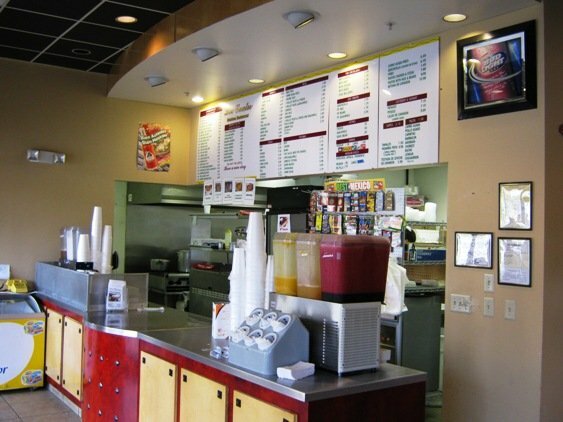 Delicious burritos, tacos, salsa and more in two convenient spots. While they both serve wonderfully inexpensive Mexican fare, I prefer to hit up the sit-down location because you’re going to need some time to finish up one of their huge meals! 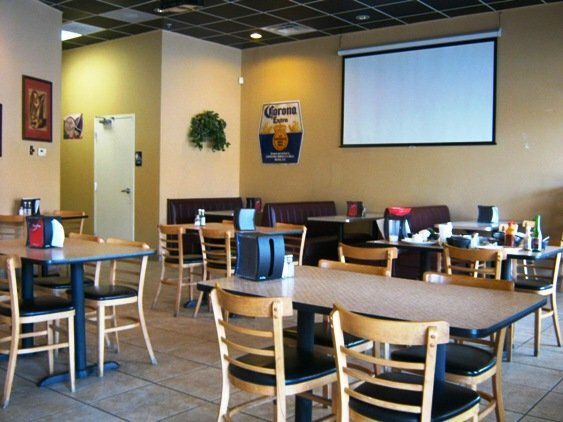 Los Cuates is a small, family-owned restaurant that seems really authentic. They don’t have a website and the majority of times that I’m there, it’s mostly Mexican patrons dining there. The family opened up Los Cuates in Raleigh after stints in Arizona and SoCal, so I’d like to think of their food as West Coast Mexican. Inside Los Cuates it’s a bit spartan with one lone television showing off futbol and Mexican soap operas. 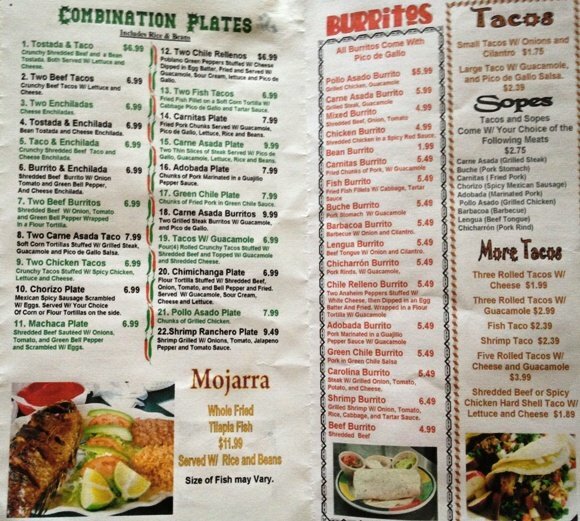 They’ve got the menu over the counter with no details so you’ll need to have an idea of what to order beforehand (or you may get a beef tongue taco, i.e. lengua!) Los Cuates does the basics: tacos, burritos, and plates in a variety of meats. Once you’re done ordering, hop on over to the salsa bar where they’ll have four choices along with some fresh veggie accompaniments. I stick to the basic red salsas but the green guacatillo looks pretty darn good. It’ll take about 10 minutes to get your food but a large basket of chips will tide you over until then. For my mains, I’ve pretty much only done lunch here and it’s typically $5 – $10 for anything on the menu. I’ve tried most of the basics: pollo asado (chicken), carnitas (pork), carne asada (grilled beef), barbacoa (braised beef), lengua (tongue) and fish, which have all been solid. The plates will come with a side of rice and beans so we’re talking about a lot of food. Drinks span from Jarritos to horchata to frescas, I recently had a tamarind fresca that was really good. A bit tangy and really refreshing which was perfect on a hot day. For tacos I’ve also tried the chicarron and chorizo, both interesting and awesome in different ways. Chicarron is basically crisped up pork belly so it’s super rich with some meatiness. The chorizo is intense and salty but the onions and cilantro take a bit of the bite out. Los Cuates does a nice plate, the pollo asado is grilled chicken pieces along with a nice plate of refried beans and fluffy spanish rice. The meals here are always carbalicious so be warned you’ll probably need a nap afterwards. 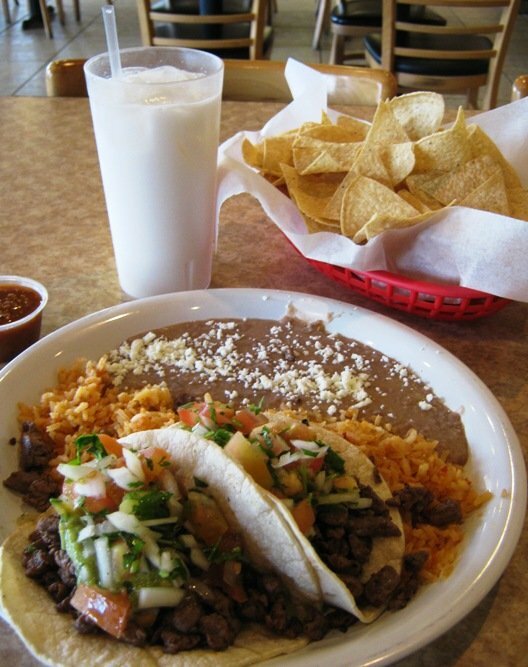 And if you’re super hungry, go for the carne asada burrito plate! 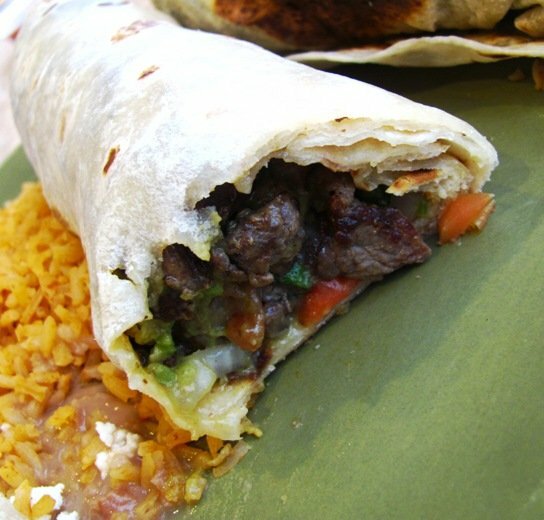 As the priciest item on the Los Cuates menu $10 may seem like a lot but whoa, wait’ll you see this plate… We’re talking two burritos stuffed with steak (carne asada), pico de gallo and guacamole, yum! Along with the usual beans and rice, if you can finish this plate by yourself, I tip my foodie hat to you! I admit that I’m more used to the SF style burritos which are stuffed with rice and beans but these Los Cuates burritos are also pretty darn good. 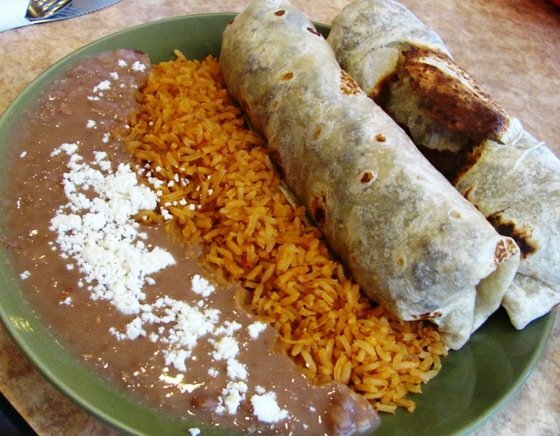 Basically if you took the rice and beans they give you as sides and stuffed them in the burrito, you’d end up with the same deal. And they do a really nice job with the burritos. They’re griddled up a bit with a nicely browned outside. The burrito wrapper is crisp but still has some glutinous chew to it. Not sure how exactly they do it but awesome-sauce! I rarely ever make it to dessert at Los Cuates because they give you so much food but they do have a couple of sweet items along with a rack of Bimbo’s sweets. So yeah, Los Cuates is my idea of down-home Mexican food. I’ll always enjoy Chubby’s for their fish tacos but for the basics in terms of Mexican food, Los Cuates hits the spot. They may not be fancy, they may be a bit out of the way but for some of the best basic Mexican fare, you can’t go wrong at Los Cuates. In espanol, los cuates means twins or friend/buddy in slang terms. And I’d have to agree that the place is appropriately named. 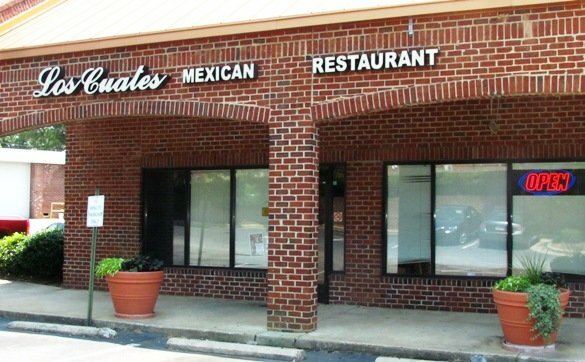 After a visit or two you’ll think that Los Cuates is your best friend when it comes to Mexican food, whether you hit up their original Old Wake Forest Road location or their drive-thru on Capital Boulevard, bueno appetito!